Glaze is one of the most used materials in the ceramic industry for seal of the fired clay for functional or decorative use, but its also one of the materials that can be really harmful for its environment when not dealt with properly. The processes of glazing and firing are so precise that in productions a lot of glaze is put out of use because glaze can quickly contaminates with dirt in its fluid milk-like stage. This has been also reason for BoomWehmeyer to conducting an experimental investigation and different experiments around the re-use and context of glaze. The porcelain collection ReMark are a limited and unique series of hand printed china porcelain cups made in our workshop in Jingdezhen. 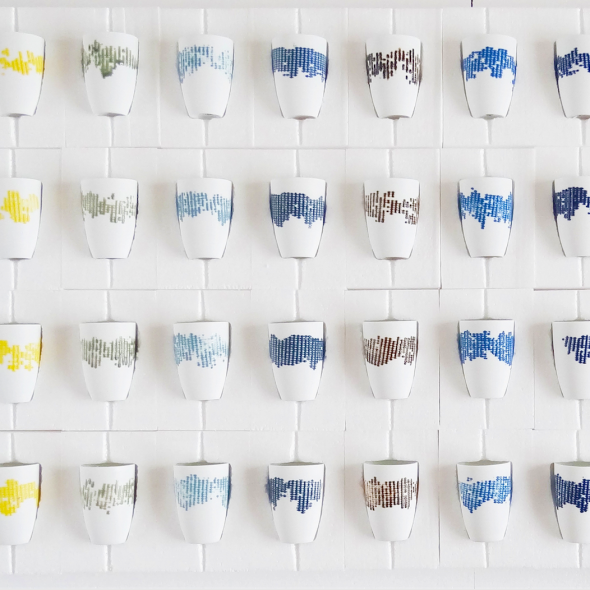 Each color series contains 4 unique cups forming together a family of traditional and contemporary colors and a support collection to engage the user/audience to contribute into the next research phases of the waste glaze project in Jingdezhen. ReMark originated from a work and researching journey around the notion off glaze waste that is processed in the local porcelain industry in Jingdezhen, China. With the work we do in Jingdezhen in the last 7 years we work, learn and collaborate with a lot of local craftsmanship, artisans and small factories, what made us even more aware of the use, recycling and after-life of the materials that are used in the porcelain processes and started our journey on how to wor with Waste Glaze and create new information, products and solutions form this. We initiated a hand’s on research where we can explore the properties of glaze but also its social , cultural and functional context. Currently we are developing different research outcomes from this project wherefrom the ReMark series are the first available series. The series have been made from collecting waste glazes from artisans and local productions to explore and research the possibilities of waste glaze. The ReMark series are only one of many paths in this research and form a group that marks the use and quality of glaze by evolving leftover production glazes to create uniquely hand printed experiences revealing the quality of tactile glaze surfaces. The glaze prints highlight an expression fired solid in its texture on the outside of the cups. Unlike the lower fired ceramics, porcelain do not need glaze to be sealed of for fluid usage. In the firing the character of strength, translucently and whiteness arise from the glass and mullite minerals within the porcelain clay. Therefore the porcelain cups are not in need of full body of glaze to create a functional waterproof body, the inside surface of the cups are glazed transparent and where one places the hand a rhythmic feel of glaze arrises giving the sensation between the raw and smooth porcelain white body and the rhythmic texture of the glaze. Glaze is often used as a decorative form to highlight the porcelain qualities, the ancient Chinese celadons are an example of this, the Longuan celadons created in China and have been refined in a family of colors and transparencies that work together with quality of the porcelain clay. From yellow, greens, blues to jade colors the celadon glazes have been part of the Chinese porcelain processes. In today’s Jingdezhen porcelain landscape we still work with celadon glazes but also more contemporaries varieties and depths that bring an interesting mix and tension between the traditional and contemporary glazes, in the ReMark series we have currently available a series bringing old and new together.